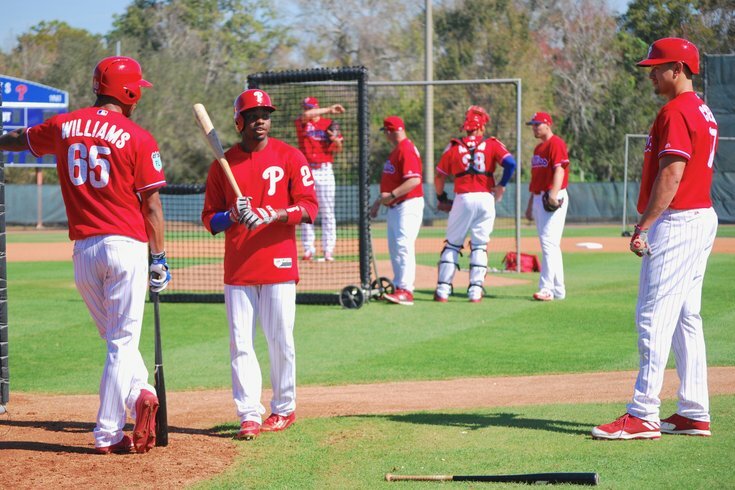 Roman Quinn, taking batting practice in spring training with fellow Lehigh Valley outfielders Nick Wiliams and Dylan Cozens during spring training, is hitting .322 with a .413 OBP in his last 24 games with the IronPigs. The beleaguered and beat-up bullpen has been an ongoing issue since the first week of the season. Their counterparts in the rotation have had a rough go for the last month, too, not making it easier for the ‘pen pals to land in regular roles and get adequate rest. But the Phillies’ current spell (losers of 18 of their last 22 games entering Tuesday) has added a new layer: the struggles of more than a couple key pieces in the lineup. It’s been a perfect storm of baseball awfulness for four weeks. A day after mulling it over, manager Pete Mackanin decided to be proactive and benched two members of that struggling lineup. Both Maikel Franco and Michael Saunders, who hit fourth and fifth, respectively, on Opening Day, are out of Tuesday’s lineup against the Colorado Rockies. Odubel Herrera could be next. Mackanin is trying to do something, anything, to get his team going 42 games into a six-month season. There’s a long way to go. Some players will snap out of their respective funks, others could be destined to have down seasons. But there is another remedy for a free-falling team that’s almost lacked any kind of pulse in the last week (they’ve lost 7 out of their last 8) after looking awfully plucky or at least competitive in the season’s first five or six weeks: new blood. And, no, we’re not talking Rhys Hoskins, who is dominating the International League but is a first base-only player who isn’t going to take Tommy Joseph’s job seven weeks into the major league season. Joseph isn’t Ryan Howard; he’s just a year older than Hoskins. And, in case you haven’t been paying attention, he’s crushing baseballs in May. Fun fact: Tommy Joseph has a better OPS in the big leagues in May (1.125) than Hoskins has in Triple-A in May (1.045). You can revisit this in, say, two months. And no, we’re not talking Scott Kingery. Cesar Hernandez is in the midst of a bad eight-game stretch (4-for-30) but that is obviously no reason to lose a job. Hernandez is slashing .304/.384/.422 in the last 365 days. Even if the front office believes Kingery (who is 23 and in his first full season at Double-A) is the long-term answer, it only makes sense to continue to play Hernandez and have him continue to establish value (ditto Joseph). Unless you’re ready to almost cut your losses with the veteran outfielders you signed this winter, veteran outfielders on one-year deals, and thus, no commitment beyond 2017. Because there is a player that’s deserving of a promotion from Triple-A who has already exhibited he can play a little bit at the big league level and who has the kind of energy that has been sorely lacking in the big league lineup for the last few weeks. Roman Quinn being a part of the current outfield mix at Citizens Bank Park makes an awful lot of sense. Quinn just turned 24. He’s on the 40-man roster. He’s healthy. And, even better: he’s also producing. Quinn, the team’s second-round pick in 2011, entered play Tuesday hitting .276 with a .347 OBP and eight stolen bases in 12 attempts in 40 games at Triple-A Lehigh Valley. The only blemish: he’s struck out 46 times (with 16 walks) in 172 plate appearances. But Quinn’s bat has really come alive in the last month. Since April 25, the speedy switch-hitter is slashing .322/.413/.444 with four doubles, two triples, a home run, and five stolen bases in 24 games. So where does Quinn play? Utility man Ty Kelly started in left field for Pete Mackanin on Tuesday night. What about tomorrow night? Saunders (signed to a one-year, $9 million contract) will be back in the regular lineup before long, but how long do the Phillies give him to get going this year when they have no reason (besides the money) to keep playing him and every reason to see what their crowded crop of outfield prospects can do in the next year? And even if they don’t cut bait with Saunders in the next month (if he’s still hitting .227 in July, perhaps) they can cut back his playing time considerably. If Saunders started, say, three or four games a week, and Mackanin decided to sit the struggling Herrera at least once a week, too, Quinn could find his way into the lineup at least four times a week, which wouldn’t hinder his development (especially since there are some folks who think he might end up being a fourth outfielder). It will get a little trickier when Howie Kendrick (also a free agent after 2017) returns, but he hasn’t played in a game of any kind since April 15 while battling an oblique injury, so, as the cliche goes, we’ll cross that bridge when the time comes. For now, the Phillies could use an injection of youth, talent … well, an injection of anything. When asked Monday about knowing when the time is right for prospects to be promoted, Klentak said it’s a case-by-case thing with each individual player. But he also said that it’s never too early and that he is on conference calls regularly with his top lieutenants. Quinn has a .429 OBP in his last two weeks in the International League. He had a .373 OBP, five stolen bases, and four doubles in 15 games as a September call-up with the Phillies last season. Call him back. Bat him in between Hernandez and Aaron Altherr at the top of the lineup on Wednesday. The timing feels right for Roman Quinn.